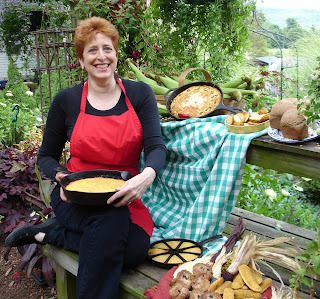 The author of the cookbook “The Cornbread Gospels,” Crescent Dragonwagon, will be signing copies of the book on 2nd Street next to the Lodge Product Tent during the National Cornbread Festival, April 26-27. "The Cornbread Gospels" will be available for purchase for $14.95 in the Lodge Product Tent and then taken to Dragonwagon for signing. Dragonwagon will also provide the history of cornbread from the competition stage on 2nd Street several times during the festival. The author of numerous children’s books and the cookbook “Passionate Vegetarian," Dragonwagon traveled to family reunions, stone-grinding mills and the National Cornbread Festival in South Pittsburgh, Tenn., hearing stories, tasting breads and learning the secrets of America’s favorite bread. Her research produced over 200 irresistible recipes for cornbreads, muffins, fritters and pancakes. The book includes a local favorite, Cornbread Salad!